By default, Fablet creates a new and separate domain name for your mobile optimized site. If you'd like to exclude theshoppad.com from your domain name, you can do so by creating a CNAME record that points to domains.theshoppad.com. CNAME records are managed by your domain provider, so it'd be best to reach out to them with any domain specific questions. Host: This is what will precede your current domain name for your CNAME record. We recommend setting this as mobile . Once you've successfully created a CNAME record that points to domains.theshoppad.com, you'll need to add it to your Fablet dashboard. To do this, follow the steps below. 1. 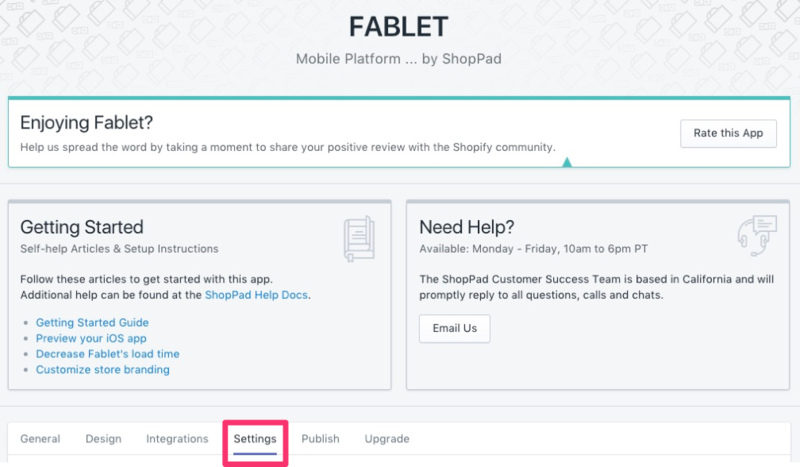 Starting from your Fablet app dashboard, navigate to the Settings tab. 2. Scroll down to the Web Domain section and paste your new CNAME record in the text field provided. 3. Click the Test Your Domain button to ensure it's working, then save your changes. If you don't see your site or the ShopPad home page when you visit the domain in your browser, the DNS record might need more time to propagate. This process can take up to 72 hours.